Interested in learning what canine massage could do for your dog? Athletic dog – Whether your dog competes regularly (in activities such as agility courses, fly ball, field work, disc dog, dock diving, or other athletic competitions) or just plays hard, massage can have a positive impact. Just like human athletes understand the value of massage to either warm up or recover from competitions, athletic dogs can see the same benefits. I regularly attend canine athletic events and owners have noted improvements in time, smoother movement through course, improved range of motion, and resolution of muscular issues resulting in limping and other dysfunction. Injured dogs- dogs that are having issues due to an injury, often times shown as limping or discomfort. I have worked with dogs with various kinds of injuries whether slipping on ice in winter or wrestling too hard at the dog park. I have also worked on dogs that had knee (stifle) injuries (both those that had opted for surgery and those that didn’t) and have found massage was able to help avoid further issues from compensation to the uninjured leg. Increased range of motion and muscular function may also help improve the dog’s ability to get around on their own. I have had several older clients that have found both pain relief and improved mobility after sessions. The quality of life was significantly improved. Although it’s not an easy time the clients I’ve worked with in this case have felt good providing relief to their canine friends in this special time. Behavioral issues- dogs with anxiety issues, too stressed out to be groomed, separation anxiety, transitioning to a new home. Massage can provide relaxation and stimulates parasympathetic nervous system. Many animal shelters are setting up massage programs to help with animals that previously had been considered unadoptable. I have worked with many clients (including my own dog Morgan) who have had major anxiety issues from being in shelters too long. I have had success gaining their trust and providing calming energy, even with dogs that the owners identified as not liking new people, or men, or event as specific as men with facial hair. Clients have repeatedly commented how relaxed and happy their dogs were after their massage. Often times the only part the dog doesn't like is when it stops. As a newer field many people do a double take when they first hear about it. The reality is the same reasons humans get massages apply to animals as well. And just like with people, it can be relevant in different ways for dogs ranging from athletic to mobility challenged. Muscle and soft tissue imbalances and injury can lead to reduced range of motion impacting daily activity. Dog massage and Reiki can help restore the body to balance and allow the dog to return to normal activity. Canine pain resulting from muscle stiffness and canine arthritis can be reduced. Anxiety/nervousness can be helped through the calming effect of massage as well as emphasizing the human bond. 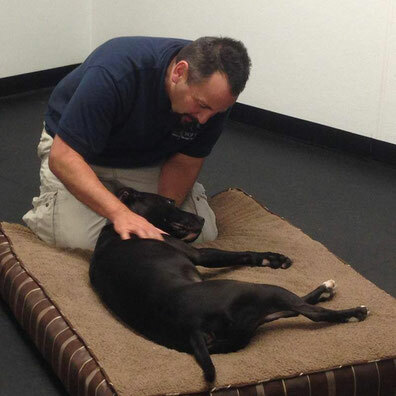 Many shelters are setting up massage programs to help with the adopt-ability of their dogs. Dogs without current known issues can be helped by maintaining their current level of function while enhancing their mental well being. Issues may be caught before they become significant through regular treatment. Athletic dogs, such as those that participate in agility and fly ball, can be maintained at a high level of performance, just like top human athletes routinely use body work. Muscle imbalance and or weakness can make the difference with how they perform. Special techniques can be used to optimize performance before an event, while maintaining and enhancing their energy level. In hospice situations massage can comfort and help with pain relief. 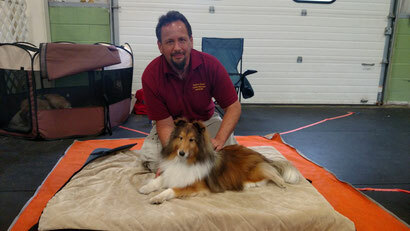 Canine Massage therapy and Reiki are not a substitute for veterinary care, but can be used in tandem to help the overall well being of your canine companion. As with any canine or pet therapy, when in doubt consult with your veterinarian. Here is a link to a recent story about us on Fox CT. The video from the story is below. Learn some skills that your dog will thank you for. Join us for a 2 hour hands on class to learn some of the basics of massaging your dog. Massaging your dog can help calm, relieve soreness, give you a better awareness of your dogs health, as well as being a bonding experience. Our next class is offered on Tuesday August 11, 2015 at 7:30 PM in Colchester, CT. The cost is $70 and attendance is limited to 8 people. Well behaved dogs are welcome. Sign up online today at http://www.tuckerstouch.com/scheduling/ or contact us at (860) 267-0765 or Dave@TuckersTouch.com with any questions. Our next class is offered on Tuesday June 23, 2015 at 7 PM in Colchester, CT. The cost is $60 and attendance is limited to 8 people. Well behaved dogs are welcome.